Budi Kemuliaan Hospital and Midwifery Academy is the largest and oldest maternity hospital in Indonesia, but its commitment to quality service reflects the high standards of its 21st century director. Dr. Mohammad Baharuddin has worked tirelessly to ensure that the women who give birth at this 83-year-old institution receive a level of care and treatment that rivals the most modern of hospitals. 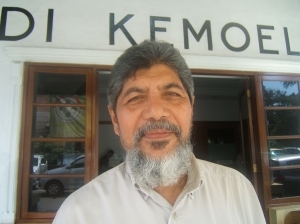 Dr. Bahar, as he is known, has promoted interventions in maternal and newborn health at Budi Kemuliaan since the private hospital served as a Jhpiego clinical training site in 2001. He was progressive then, colleagues recall, and, as head of medical services, committed to putting into practice evidence-based standards of care that would improve the health of mothers and newborns. As he became familiar with Jhpiego’s pioneering standards-based management tool to improve quality of care, Dr. Bahar initiated a version of the program at Budi Kemuliaan. Deliveries at the hospital have increased from 3,000 a year in 2001 to nearly 8,000 now. There are also 30,000 antenatal care visits to the hospital each year. Dr. Mohammad Baharuddin has led efforts to improve services at Budi Kemuliaan Hospital. “He was extremely open to adopting new maternal and newborn health best practices in his hospital, and as far as I know has become a champion in his own country, and has been to Afghanistan to train others,’’ says Jhpiego’s Director of Maternal and Newborn Health, Patricia Gomez, who helped organize a regional experts’ training at Budi Kemuliaan in 2001. Dr. Bahar also directs Budi Kemuliaan’s midwifery school and supports joint training of obstetricians and midwives, “something not all physicians are willing to do,” says Gomez. While Budi Kemuliaan’s core areas are service delivery, education, training and research, Dr. Bahar has recognized the health impact of today’s social ills and set out to address them. The hospital offers seminars on domestic violence, prevention of human trafficking and workplace improvement for factories that employ women. Dr. Bahar’s dedication to improving the health of mothers and newborns is both a professional and personal concern. His mother died in childbirth when Dr. Bahar was eight years old. His older brother was in medical school at the time, and the young Bahar would often gather around his brother and friends as they pored over their anatomy books. The younger brother decided he too would become a doctor. After running a community health facility on the island of Riau, Dr. Bahar decided to train as an ob/gyn. He was recruited for a job at Bud Kemuliaan because the director felt Dr. Bahar knew “how to work with poor people,” who made up a large portion of the hospital’s patients. With help from Jhpiego, Dr. Bahar began strengthening the staff and hospital practices, focusing on improved maternal and newborn health. The results include significant improvements in infection prevention, compliance with international best practices, introduction of longer-term research projects for midwifery students and free wireless Internet access at the midwifery school. Earlier this year, Jhpiego staff met with Dr. Bahar at his renovated and expanded hospital. “This was the most special of many hospitals that I have visited during my stay in Indonesia, not for its infrastructure or technology, which are substantial, but for the quality of the providers who are delivering health care,” said Richard Embry, Jhpiego’s Country Director for Indonesia.